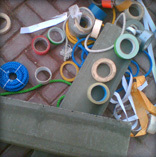 Equipment for grips on the Sony Bravia Iran TVC shoot. "Shall we go for another plate and try one of the duck spring-rolls or save ourselves for the deserts? ", we toiled while sat in one of the finer skyscrapers on Dubai's Shayk Zayad Road. The international all-one-can-eat buffet was proving to be one of the Middle East's many trouble spots – yet things got worse, having just left enough room for desert it took me a few attempts figure out how to get the best results from the chocolate water fountain and strawberries. "Daveed, can you go to Dubai the day after tomorrow? ", enquired my manager with an unusual caution... I flinched, considered the necessary national documents now available to me and held back a smile, "let me check my diary", I acted out. 'Dinner with uncle' and 'Go to Karaj' – "Yes, it should be ok", I conclude with as serious a face as I could hold. I was chuffed, and for many reasons – being two weeks into this new job and being asked to represent the company abroad was one of the smaller ones. My agenda was set, quickly scribbled out as the working week ceased. A golden ticket slid across the director's table confirming my virgin voyage with Emirates following by two silver-tinted notes. I counted the zeros unaware of the exchange rate yet aware that zeros are worth more in other countries. Laptops were set up and cigarettes lit in preparation for a fast paced preproduction meeting between multiple nationalities from multiple companies. 'Creative Director', stood the words beside my name on the first page of the preproduction booklet handed to each of the 15-attendees. Our trio represented the Iranian side of things, mostly drafted in to test credibility and to enlighten others of what little is permitted in our style of republic. Intricacies were presented, debated, altered and possibly embraced. Each frame and square millimeter of it negotiated – add a car – don't, get me a water canal – don't, focus on this – don't, wear a striped t-shirt – don't – "It might be seen as an American flag" we warned. Music was presented, "too Arabic", the cast was presented, "too poor looking", wardrobe was presented, "too revealing"
The Sony manager – our client – doodled, adding little to the theatre of conceptual contortion as we tore to pieces the delicacies presented by the director. Considering I'd not slept the previous night I was alert and attentive, enjoying the 4-hour episode, thriving from the energy put into getting a workable result. Music was presented, "too Arabic", the cast was presented, "too poor looking", wardrobe was presented, "too revealing". "We don't have drains like that in Iran", I regretfully informed the Italian director while he was aiming up his shot. I tried explaining the simplicity of Tehran's drainage system, intrigued as to quite what solution the production team would provide in our Dubai location. The director had previously bragged that he'd made Cuba look like London and as we huddled around the monitor we fell for his lie. I stood back as he raced through the shoot with grips struggling to attend to his demands while those whose work fell between were getting familiar with one another. Iranian extras sat gossiping, cars sat revving and the client sat smoking. For all the "Action! Action! Action! ", a few seconds were born, now we sit and wait to see what gets religiously cut.